We are making a clarification change to Alchemical Mask. This should clear up some confusing wording on how Alchemical Mask relates to clouds, and the concealment granted by those clouds. The previous wording resulted in some overly complex and confusing rulings we had to make, so we decided to just alter the wording to ensure it reads much smoother. 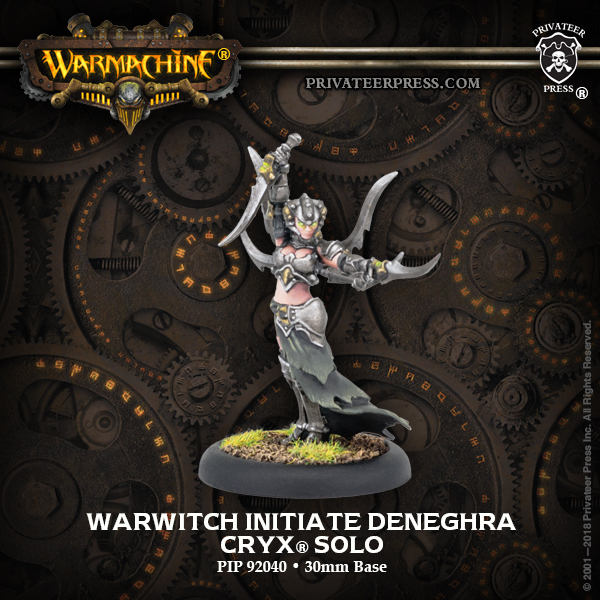 Each the models listed below are every model in WARMACHINE & HORDES with Alchemical Mask, and this new text has been updated on all their cards to reflect the change. Alchemical Mask – This model does not suffer gas effects. When determining LOS or resolving attacks, this model ignores cloud effects and concealment granted from cloud effects. We made a small adjustment to Piggybacks (and by extension, the new Piggyback Officer) in the Grymkin CID to give them a small boost to their ARM, from 13 to 14. We found that at their previous ARM, they were just a tad too soft defensively unless you also brought along a Death Knell, which heavily influenced their opportunity cost in lists. This change means they are suitably tough without the Death Knell or reach more elite levels of durability when paired with one. We think this change allows the Piggybacks to be included in more lists without soaking up too many points of support unless you really want to commit to a particularly sturdy army that favors soaking up the enemy alpha strike, which should give players a bit more flexibility in list building. Add “Malady Man units” and “Baron Tonguelick, Lord of Warts” to the Army Composition section. We added two of the new model entries to Dark Menagerie. Baron Tonguelick, as the new attachment, is an obvious addition. However, the Malady Man is a tad more of an edge case addition. Our decision was to provide an alternative, cheap unit to a theme force that specializes in an extremely large and diverse warbeast package. Even though we don’t expect the Malady Man to fit into every Dark Menagerie army, we wanted to give the players the option of an accessible unit for scoring, contesting, and other uses. Add “Baron Tonguelick, Lord of Warts” and “Grave Ghoul solos” to the Army Composition section. 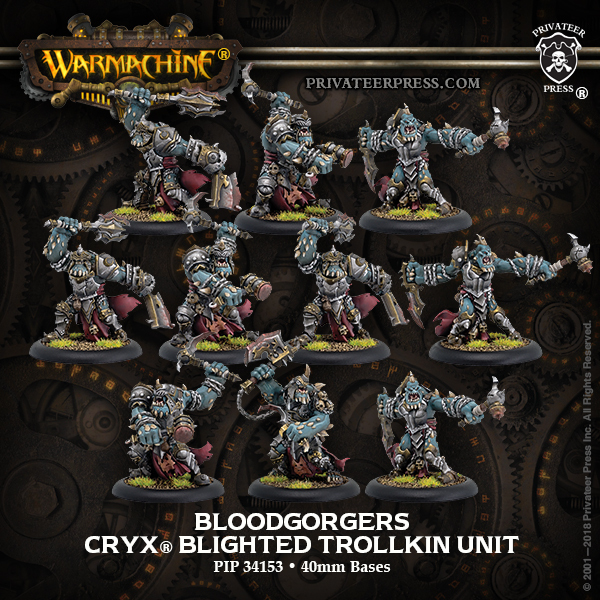 For every 20 points of Grymkin units and Grymkin battle engines in this army, you can add one Malady Man unit, command attachment, or solo to the army free of cost. Free command attachments do not count toward the total point value of units in the army when calculating this bonus. Much the same as above, we have added the new model entries to Bump in the Night. Remember, Bump in the Night automatically includes all Grymkin units, which means the Malady Man is an automatic addition to the theme force. Additionally, the have added the Malady Man as one of the free options in Bump in the Night. This should provide some creative list building options, and the new Neigh Slayer Warhorse and Piggyback Officer should also breath some new life into their respective units and how they are utilized on the battlefield. Stormbreak is a one-month narrative league for WARMACHINE and HORDES that is part of the larger narrative event centered on the occupation (and potential liberation) of Llael. The previous chapter of this event was Winter Rampage 2019, in which players affected the outcome of the battle at Riversmet. Stormbreak focuses on the next major battle in this saga, the Siege of Merwyn. The imperial occupants of Llael, Khador, are constructing something that could change the face of war in the Iron Kingdoms forever. Utilizing technology stolen from Zu, Khadoran engineers are building a super-weapon in the city of Merwyn. As a result, the city is completely locked down by the Khadoran Invaders—the only way the Llaelese Liberators can hope to stop the construction of this super-weapon is through war. Of course, not everyone converging on Merwyn has Llael’s best interests at heart—some care only about their own ill-gotten gains, Opportunists looking to make quick coin off the suffering of others. As a participant, you must decide which Agenda you will join: the imperial Invaders, the vengeful Liberators, or the cunning Opportunists. The results of your battles will massively affect the final narrative event in this saga at Lock & Load GameFest 2019, an event that will decide the ultimate fate of Llael. Wins and losses are reported online each week, the global results determining the overall winning Agenda of this event. In-store participants can earn special Tank Commander participation patches by playing league games throughout the event. Stormbreak rules can be found here. Prize kits can be purchased through distribution, or our online store (viewable only when logged into a registered retail account) here. Las Vegas Open 2019 is quickly approaching, and you won’t want to miss out! Join us February 8th through the 10th at Bally’s Casino in Las Vegas for three days of wargaming, socializing, and general mayhem! There’s plenty to keep you busy at LVO, including Privateer Press and other vendors, painting and terrain classes, and social events for those who may not be gaming during the day. But if that’s not enough, it’s Vegas, baby—there’s entertainment and diversions around every neon-lit corner! Tons of other great prizes and swag! We look forward to seeing all our friends, and hope to make some new ones this year! If you have any questions, don’t hesitate to reach out to us through the website at https://www.lasvegasopen.net/! Bellevue, WA — Privateer Press’ first Organized Play event of 2019 for WARMACHINE and HORDES, Winter Rampage, launched this month with a twist: outcomes of players’ participation in the story-driven event directly impact the games’ overall setting. At the center of this single-day event lies the war-torn nation of Llael, which is besieged by Iron Kingdoms enemies on one side but protected by allies on the other. As players participate in the growing narrative to determine the fate of the nation, the Organized Play team at Privateer collates player reports to determine the next part of the story. These outcomes are then incorporated into the setting’s latest work of fiction, the third installment in author Aeryn Rudel’s Acts of War series. Part I of Stormbreak has already been published (http://privateerpress.com/organized-play/winter-rampage), and part II is being drafted as reports are submitted. There’s still time for players to get in on the action and determine the course of the Iron Kingdoms history. Retailers are able to obtain Winter Rampage 2019 Prize Kits by logging into their accounts on the official Privateer Press store (store.privateerpress.com), and they can continue to host and report events through January 31, 2019, in order to impact the story. The next event begins in April. The ongoing installments of Stormbreak, reflecting player input from this first Winter Rampage even, will be available for free through the Privateer Press Organized Play site. Bellevue, WA — Privateer Press has announced that on Monday, January 14, it will launch a Kickstarter campaign for The Art of Privateer Press, an art book requested by fans of Privateer Press’ games for nearly 20 years. Illustrations will come from Privateer’s multiple fantasy and science-fiction worlds, including the Iron Kingdoms, WARMACHINE, HORDES, Level 7, and more. In addition to a full-color hardback—with a minimal page count of 144 pages and a final page count determined by pledges that unlock stretch goals—the campaign will also include a preview miniature, J.A.I.M., otherwise known as the Iron Maiden, from a future Privateer Press game and, at higher levels, sketchbooks of concept art pieces, some of which have never been published before. The campaign will launch January 14 and run through January 25. 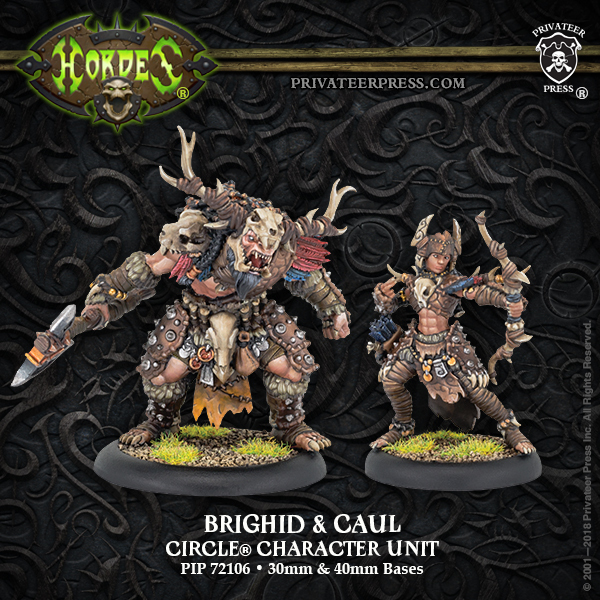 Privateer Press expects to ship the preview miniature in May and the sketchbooks and book itself in fall 2019. Backers will find a wide variety of different pledge levels to consider—from digital content to limited-edition sketchbook options, all of which include the Iron Maiden miniature. 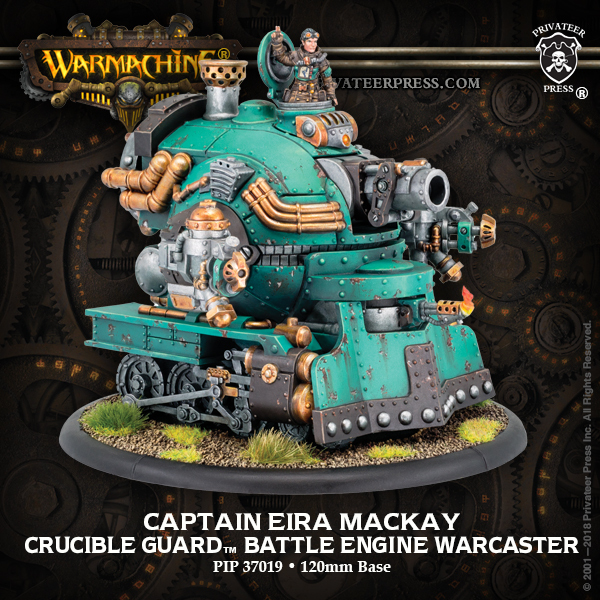 The miniature itself has been designed to be playable in every WARMACHINE and HORDES game Faction to ensure the broadest appeal to players, and all backers will have their names included in the book’s dedication. The Art of Privateer Press Kickstarter campaign can be found beginning January 14 at https://www.kickstarter.com/projects/privateerpress/the-art-of-privateer…. 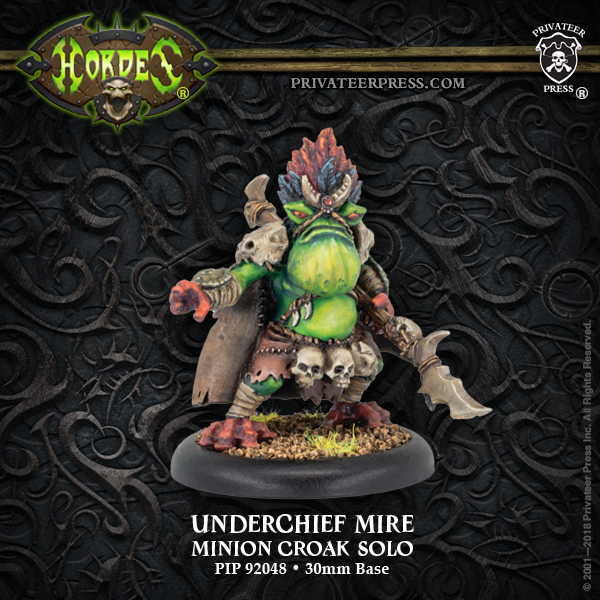 Privateer Press, Inc. (privateerpress.com) is an award-winning publisher of games and game supplements based in Bellevue, WA. We produce the acclaimed WARMACHINE® and HORDES® tabletop miniatures wargames, the Monsterpocalypse® pre-painted miniatures game, the Iron Kingdoms® Full Metal Fantasy and Iron Kingdoms® Unleashed roleplaying games, the Undercity™ and Widower’s Wood™ adventure board games, and the LEVEL 7® survival-horror board game line. We also produce the Formula P3™ hobby tool and paint range in addition to the other products in our catalog. We are focused on producing the finest gaming products on the market today as we continue to build and expand the richness of our games and settings. We are in search of great people who are enthusiastic about producing engaging and enjoyable experiences and who can appreciate the inherent beauty of giant steam-powered robots smashing each other to pieces. We are a hard-working crew who derive satisfaction from a job well done. We work in a fast-paced, results-driven environment, and we seek a highly confident individual with excellent interpersonal skills and an ability to build rapport with new and existing customers over the phone and in person. This is a full-time position in our Bellevue, WA office. •	Direct sales (or through distribution sales) to retail stores – existing accounts and new accounts. •	Make direct contact with retailers to promote products as well as gather feedback and data that can be applied to product development and growth strategies. •	Promote sales, retention, and acquisition at the retailer and club level with in-store and club programs such as leagues, release events, and special promotions. •	Liaison with Marketing to ensure marketing goals are being met at the store level and collaborate on future promotions coordinating with product releases, events, etc. Trade Sales will have input with Marketing. •	Coordinate and send weekly emails to retailers. •	Determine product selling points and setting sales strategies. Marketing and Graphic Design will be made available. •	Evaluating effectiveness of sales initiatives. Proper CRM software will be purchased at a later date, if current software is just not adequate. •	Recommend product enhancements to boost sales / gain new customers, such as OP kits, Point of Sale materials, displays, etc. •	Attend events, conventions, and tradeshows as a representative of Privateer Press. •	Travel to industry trade shows (e.g., GAMA), distributor open houses, and large consumer conventions (e.g. Gen Con). 3)	Send your resume and cover letter to jobs@privateerpress.com, and make sure the subject line says “Trade Sales Account Manager—[your name].” Example: Trade Sales Account Manager —John Doe. Below are changes that came out of the Skorne CID. Our thanks to all who participated in this CID cycle! Reconstruction – During your Maintenance Phase you may remove one soul token from this model to return one destroyed medium-based friendly Faction construct Grunt to play, or remove up to three soul tokens from this model to return one destroyed small-based friendly Faction construct Grunt to play for each token removed. Place each returned Grunt completely within 2˝ of this model and in formation. The change to the Enigma Foundry should help increase the relevance and power level of the Clockwork Legion theme force and return a unique feel to the recursion mechanics inside of the Convergence of Cyriss. Makeda immediately casts Incite without spending fury. Additionally, when a model in Makeda’s battlegroup destroys one or more enemy models in her control range with an attack, either Makeda can gain 1 fury point or 1 fury point can be removed from a model in her battlegroup that is in her control range. Dance of Death lasts for one turn. Overtake – When this model destroys one or more enemy models with a basic melee attack during its Combat Action, after the attack is resolved it can immediately advance up to 1˝. Cut Ground Zero, Hand of Death, and Vortex of Destruction. Add Bladed Gale, Bulwark, Deathbringers, and Incite. Models hit lose Flight for one round. While in the spellcaster’s control range and B2B with one or more models in its battlegroup, models in the spellcaster’s battlegroup gain +2 DEF and cannot become knocked down. Friendly Faction models gain +2 to attack and damage rolls against enemy models while the enemy models are in the spellcaster’s command range. Incite lasts for one turn. A substantial overhaul. Makeda 3 is almost an entirely new warlock. I will let the changes speak for themselves, but players should be able to play this warlock in a few different armies and lead the Skorne Empire to victory on the front lines. Irregulars [Ancestral Guardian] – Ancestral Guardian solos can be included in any army that also includes Supreme Aptimus Zaal. Soul Converter – Once per turn at any time during its activation, this model can spend 1 fury point to give each friendly Exalted model with Soul Taker: Gatekeeper currently in its control range one soul token. The addition of Irregulars allows Zaal to bring Ancestral Guardians into any theme force he plays in, which should really open up the themes available to him. Slight wording updates to Soul Converter help smooth out some of the issues in the Exalted theme force. Irregulars [Void Spirit] – Void Spirit solos can be included in any army that also includes Void Seer Mordikaar. Much like Zaal 1, Mordikaar 1 will be able to bring Void Spirits in any theme force. This change is minor but will allow the Bronzeback Titan to interact with the Agonizer. Sturdy – This model cannot be pushed. Venom Blaster RNG SP 10, AOE -, POW 14. Cut Arcing Fire and Scather. After a rather substantial rework, the Sentinel is now quite different from the Titan Cannoneer. Changing the ranged attack to a Spray opens a unique place for the Sentinel. The spellcaster gains concealment. Living enemy models suffer –2 to attack rolls while within 2˝ of the spellcaster. Swarm lasts for one round. Much like the Sentinel, the Aradus Soldier received updates to further differentiate it from other options in the Faction. Gain 1 Mind damage box. Hyper-Aggressive – When this model suffers damage from an enemy attack at any time except while it is advancing, after the attack is resolved it can immediately make a full advance directly toward the attacking model. Beat Back – Immediately after a basic attack with this weapon is resolved during this model’s Combat Action, the enemy model hit can be pushed 1˝ directly away from the attacking model. After the enemy model is pushed, the attacking model can advance up to 1˝ directly toward it. The Bronzeback received significant updates to bring it in line with the rest of the game. Hyper-Aggressive, Beat Back, and a strong animus make this a much more enticing model. A slight bump in MAT makes the Brute a stronger choice. Acid Spray RNG SP 8, POW 14. Cut Concentrated Blast (★ Attack). A point drop and some upgrades to its ranged attacks put the Desert Hydra into a solid place. Despoiler was operating in lists how we wanted it to, but it did not feel worth its points. A slight point drop helps mitigate this issue. Cut Assault and Shooting Gallery. Pain Maddened – When this model is damaged by an enemy attack, this model gains +2 SPD for one round. Full Battery Fire (★ Attack) – This weapon becomes POW 20 for this attack. On a direct hit, models hit are thrown d6˝ directly away from the attacker. Roll distance once for all models affected. Models thrown do not deviate. Move models farthest from the attacker first. Instead of suffering blast damage, models hit but not directly hit suffer a damage roll with POW equal to half the POW of this attack. The POW of collateral damage is equal to half the POW of this attack. Dropping points, increasing RAT, and adding additional special rules carve out a unique place for the Mammoth to exist in the Skorne Faction. As a strong melee presence and a solid gun platform, the Mammoth brings something unique to Skorne. A slight bump in melee range should increase the viability on the Razor Wurm. Tiberion is a strong melee warbeast but cost slightly too many points. A drop was warranted. Gain 2 body damage boxes. The Cannoneer had some minor tweaks that should make it shine as a hybrid melee-ranged heavy warbeast. Reducing the point cost of Immortals to 8/13 should bring them in to line with other similar infantry. Grave Mist – At any time during its activation, this model can spend one soul token to give models in its unit +2 DEF for one round. In this CID, we needed to be expand the niche use of the Extoller Advocate. Grave Mist now grants +2 DEF all the time instead of Concealment, standardizing the rule, making it easier for players to utilize, and increasing the power level of the Command Attachment. Resonance [Immortal] – An Immortal model/unit activating within 5˝ of this model gains +2 movement when advancing as part of its Normal Movement that activation. A slight bump in POW of the Halberd will increase the offensive potential of this model slightly. Additionally, Resonance received a wording update to make it clear how it functions. Harmonious Exaltation (★Action) – RNG CMD. Target this model’s warlock. If it is in range, once this turn when the warlock casts a spell, reduce the COST of the spell by 1. Cut the Soul-Powered special rule. Annihilating Gaze – When a living or undead model is hit by this attack, add its current STR to the damage roll. Ghost Shot – This model ignores LOS, concealment, and cover when making attacks with this weapon. Marketh received a substantial upgrade in abilities and effects that should help not only The Exalted theme force but several others as well. A small point drop helps Hakaar feel more at home in the Exalted theme force. Replace Soul Ward with Direct Spirits. Direct Spirits – When a friendly living Faction warrior model is destroyed in this model’s command range and generates a soul token, you choose which model with the Soul Taker ability gains the destroyed model’s soul, regardless of the proximity of other models. Enemy models are not eligible to gain soul tokens from models destroyed in this model’s command range. Well of Rage – Once per turn, at anytime during this model’s activation, you can remove up to three soul tokens from this mode to return one destroyed small- or medium-based friendly Faction non-character trooper warrior model to play for each token removed. Models return with 1 unmarked damage box. Place the returned Grunts completely within this model’s command range, in formation, and completely within 3˝ of another model in their unit. Returned Grunts must forfeit their Combat Actions the turn they are returned to play. The Supreme Guardian upgraded its soul manipulation mechanic to Direct Spirits, a much more powerful version of its previous rule, Soul Ward. Additionally, Well of Rage has been modified to allow the return of non-character trooper models, opening up the ability to a wider variety of options. For every full 20 points of Convergence units and solos in this army, you can add one Convergence command attachment or Convergence solo to the army free of cost. Free command attachments do not count toward the total point value of units in the army when calculating this bonus. Clockwork Legions received clerical updates, removing confusing interactions with its benefits. Add “Chiron” to the Army Composition section. This army can include any number of Minion units and Minion solos. These models/units can be included even if they have the Partisan [Skorne] special rule. Disciples of Agony had its composition rules tweaked slightly to open up list-building options. Add “Despoiler” to the Army Composition section. The Exalted received a new theme benefit that replaced the original Death Rage benefit. Players during the CID found this to be a much more exciting and compelling benefit. Add “Molik Karn” and “Aptimus Marketh” to the Army Composition section. For every 30 points of Skorne warbeasts and battle engines in this army, you can add one Agonizer or Basilisk Krea warbeast or Skorne solo to the army free of cost. Free warbeasts do not count toward the total point value of warbeasts in the army when calculating this bonus. Adding both Marketh and Molik Karn and opening up the options for free models really makes this theme feel more versatile and should allow players more freedom when list building. Cut “non-character warbeasts without ranged weapons” and “Basilisk Krea warbeasts” from the Army Composition section. Add “non-character warbeasts,” “Ancestral Guardian solos,” and “Supreme Guardian” to the Army Composition section. For every full 20 points of Skorne units, Skorne dragoon solos, and Skorne battle engines in this army, you can add one Skorne command attachment, one Tyrant Commander & Standard Bearer unit, or one small- or medium-based Skorne solo to the army free of cost. Free models do not count toward the total point value of units in the army when calculating this bonus. Removing restrictions from Masters of War and adding additional models opens up list building for the theme. Additionally, opening up free model options can really let the theme find its stride. While there was never any intention on Privateer’s part to draw a parallel between the Crucible Guard character Adolpheus Morely and any historical figure, some members of our community have continued to question this connection. While we thought we had sufficiently addressed the reality of some thin but unfortunate similarities, the matter has come up enough times that we have chosen to retroactively change the character’s name so there will be no further confusion that provokes comparisons to any historical personality. The Iron Kingdoms is a fantasy setting, and we do not use it to make any commentary on real-world history; as such, we find any such comparisons unacceptable. To ensure an end to any misrepresentation, the character’s name has been changed to “Alejandro Mosby.” The corresponding stat card on the online database and War Room have been updated to reflect this change, as will our sales catalog and online store entry. The blister slip packaging will also be updated at our first opportunity. We appreciate your understanding as we make this adjustment to Iron Kingdoms canon. Send your resume and cover letter to jobs@privateerpress.com, and make sure the subject line says “Convention Manager – [your name]”. Example: Convention Manager – John Doe. WARMACHINE WEEKEND IS NOV 2 THROUGH NOV 4! MONSTERPOCALYSE PRERELEASES – AT THE SHOW ONLY! WARMACHINE/HORDES PRERELEASES – AT THE SHOW ONLY!